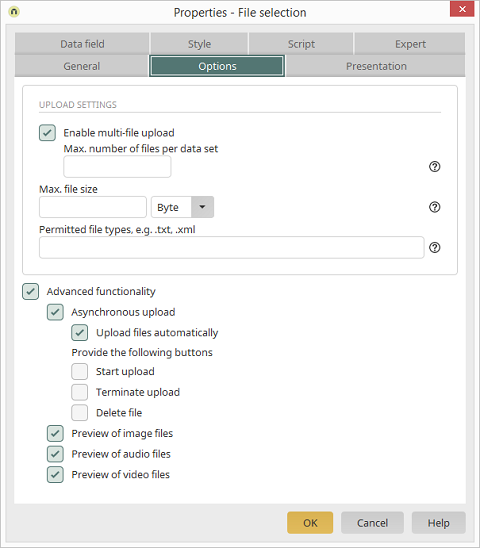 Allows multiple files to be uploaded for each data set. Underneath, you can specify what the permitted "Maximum number of files per data set" is. You can specify the maximum file size that can be uploaded here. Select the desired unit in the list to the right of the edit field. You can also select the "Max. number of files per data record" and "Maximum file size" for a file field. If you do not want to restrict the file size or number of files, leave the corresponding fields empty here. The setting you define there is decisive for the File selectioncontrol. This means that, for example, if you define a maximum of size of 10 MB in the file field properties, the File selectionis unable to upload more than 10 MB, regardless of the number you set in its properties. If you set a maximum of 5 MB for the File selection, for example, the data field will allow up to 10 MB, but the control will only permit 5 MB to be uploaded. Therefore, the setting in the File selection properties takes priority when setting restrictions. The same principle applies for the setting for the "Allowed file types", which you can also specify in this dialog. Enter extensions for "Allowed file types" with a period in front of them, such as ".txt" or ".xml", each of them separated from the others with a comma. These entries are not case-sensitive. Wildcards cannot be applied here. When testing, whether a file is permitted or not, only the ending will be tested. In principle, if for example "document.txt" is entered here, the test will interpret all files as permitted that end in "document.txt", even a file with a name such as "my-document.txt". Click here to enable the advanced settings beneath. Enables individual files to be uploaded to the server without saving the data set at the same time. However, the assignment to the record will only be created when the data set is saved. With this, the upload process can be controlled more precisely, especially with large files. Please note that the user needs to be informed about this process. If this is not the case, we recommend using the "Upload files automatically" option. Means the files added by drag-and-drop are immediately uploaded after the mouse button is released. The corresponding buttons will be shown on the end device, allowing the upload process to be controlled accordingly. The preview is shown when the file has already been selected but the data record has not been saved yet. When viewing an existing data record, this setting is not relevant for the presentation, but rather the setting for the thumbnail.